“Franciscan Friary, Ardfert, Co Kerry, interior - choir and south cloister walk,” Gothic Past, accessed April 18, 2019, http://gothicpast.com/items/show/1248. Photograph by Roger Stalley. 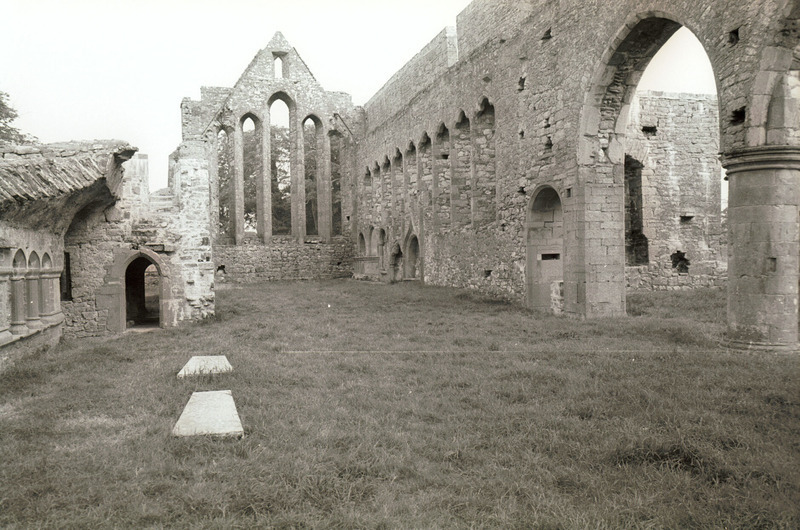 View of nave through to south transept and south cloister walk from north - west(north elevation missing). East end has five graded lancet windows with one additional lancet in the centre of the gable. South elevation has nine trefoil - headed lancet windows with niches below which have round, trefoil and ogee - headed arches. A round - headed entrance leads to the south transept. A pointed arch, carried on one square and one cylindrical pier with bell capital, also opens into the south transept from the nave.